The ProForm Hybrid Trainer Pro is a combo machine- part elliptical, part recumbent bike. It’s also actually an upgraded version of their original, less expensive Hybrid Trainer. In theory, the idea of a dual machine sounds great, especially if you don’t have the room for two separate machines. But in reality, can the ProForm Hybrid Trainer Pro deliver a serious workout? Are the upgrades significant enough to warrant the extra cost? These are both good questions and will both be answered within this review. After reading this, you should have a thorough understanding of what this machine has to offer. You will also have a better understanding of whether this hybrid trainer is a good fit for you or not. ProForm is one of the most recognized names in home fitness. They’re probably most well known for their folding treadmills, but they actually manufacture a lot of different home machines, including: ellipticals, bikes, and their popular HIIT trainers. They’ve been in the game for over 30 years and are part of the ICON Health & Fitness family. Something most Proform products have in common is their hi-tech features, including larger, nicer screens (often touch screens) and iFit compatibility. ProForm isn’t the only brand offering hybrid trainers, but they’re probably the most well known brand. Now that you’ve been formally introduced, let’s take a look at the Hybrid Trainer Pro. ProForm’s Hybrid Trainer Pro is a combination of an elliptical trainer and a recumbent bike. The goal is to offer users the benefits of both machines in the convenient form of a single trainer. Recumbent bikes are nice because they offer a gentle form of exercise with minimal stress on joints. Ellipticals offer the same, except in a standing position that burns a few more calories and gets the arms involved. 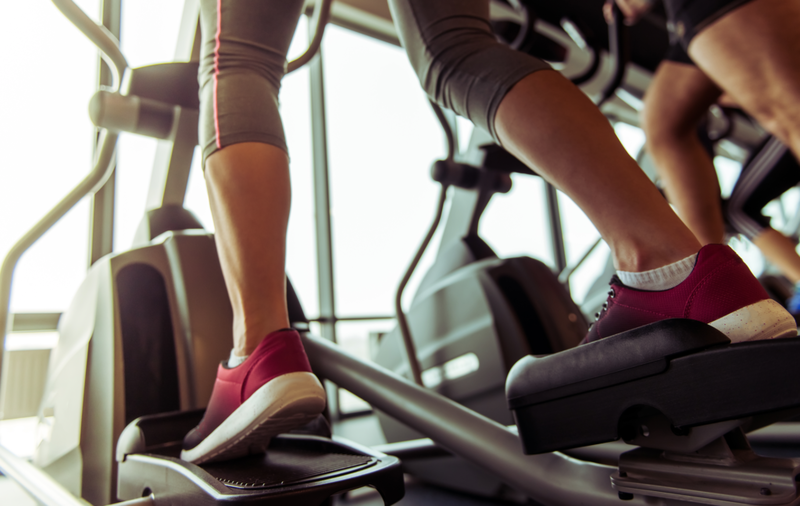 When it comes to ellipticals, stride length is usually one of the most important specs to consider because it directly equates to how comfortable it’s going to feel using it. This hybrid trainer has a stride length of 17″, which isn’t bad for a combo machine like this. The gold standard on stride lengths is 20″ because that’s the length necessary to accommodate most users comfortably. At 17″, it should feel fine for users in the 5’3″ – 5’7″ height range. If you’re over 5’7″, odds are it’s going to feel a little tight. And by that, I mean it’s going to feel like you aren’t stretching out far enough with your stride. But again, this is a hybrid- I’m not sure it’s fair to expect the highest quality elliptical features and the highest quality bike features. To put it another way, if you are expecting the most comfortable elliptical (or bike) you’ve ever used before, then you will probably be disappointed. Just because the stride length is a little short, doesn’t mean you can’t get a good cardio workout though. As an elliptical, the Hybrid Trainer Pro does have moving handles to let you workout your arms at the same time if you choose. It also has stationary handles if you just want to work on your legs. As a recumbent bike, it comes with an adjustable seat with added cushioning and lumbar support to help make your ride as comfortable as possible. The rail the seat sits on is actually slanted, so when you adjust the seat position you are actually adjusting in vertically and horizontally- the extra vertical adjustment should help with getting the best fit. When you first look at the machine, you might wonder how the pedals work for the bike- there’s no way the elliptical pedals are going to feel right when cycling. Luckily, ProForm saw this coming and added a separate flip up pedal for the bike. So don’t worry- you don’t use the horizontal elliptical pedal when riding the bike. I mentioned that the stride length is short. Well, from the biking perspective the pedal motion isn’t perfect either. User’s notice that the motion isn’t completely circular like a traditional recumbent bike. Instead, it’s more of an elliptical pattern (shocker). Some folks report it feels kind of like a leg press motion. The display screen also tilts down when you’re riding the bike, making it easier to see the display. It would be tough to see the screen when sitting on the seat if it didn’t. Again, remember this is a hybrid trainer- it’s a cooperation of both elliptical and bike functions. Neither is going to feel perfect. But the good news is this trainer is able to provide a pretty solid workout as an elliptical and as a recumbent bike. 20 levels of digital resistance: with this much resistance, you should be able to fine tune your workout whether you’re sitting or standing. Adjust your resistance with the push of a button on the monitor, no knob turning here. 20 programmed workouts: the Hybrid Trainer Pro comes loaded with 20 different workouts (10 for the elliptical + 10 for the recumbent bike), should be enough to help get you started and keep your workouts from getting too stale. iFit ready: ProForm always makes their products compatible with iFit, their hybrid trainer is no different. iFit is a fitness app that helps you track all your metrics, as well as give you access to personal training workouts, nutrition guidance, and so on. You have to subscribe to it separately and use your own tablet, which is kind of a bummer. Integrated tablet holder: since you have to use your own tablet for iFit, ProForm was kind enough to give you a place to store it on this trainer. I like that the table holder is elevated behind the display screen so you can see both at the same time without obstructing either. LCD monitor: I’m not sure I would call this monitor large, but it’s big enough to get the job done. The screen is pretty simple, no fancy touch features or anything like that. But it’s big enough to see your metrics while you exercise. Speaking of which, it shows speed, distance, time, heart rate, and calories. Surprisingly, it isn’t backlit, so I wouldn’t try to ride in a dark room. Grip heart rate monitors: there are grip heart rate monitors on the stationary handles. Nothing too fancy here, they work about as well as any other grip heart rate monitors you’d find. Built-in speakers: the Hybrid Trainer Pro has 2 2″ speakers built-in the console. You can plug your mp3 player right into the trainer and jam out while you workout. Cushioned elliptical pedals: the oversized, cushioned elliptical pedals are designed to keep your feet in place and comfortable when standing on the trainer. It’s always important to consider max weight capacity when considering any piece of home fitness equipment. Not only does it ensure you can safely use said piece of equipment, but it gives you a clear, objective measure of how sturdy it is. Higher is always better because if a machine can handle a heavier user, it means it has to be more sturdy. The ProForm Hybrid Trainer Pro has a max weight capacity of 350 lb. This is pretty impressive, especially for a machine in this price range. This is an area where we see a pretty significant improvement over the classic Hybrid Trainer, which only has a 5 year frame and 90-day parts and labor warranty. I think the Pro has a pretty awesome warranty, given the product and price range. One year parts isn’t amazing, but for the price, it’s definitely in the right ballpark. I wanted to include a quick comparison between the two ProForm hybrid trainers because there are so pretty significant differences. Sometimes when a brand comes out with an “upgraded model” the differences are barely noticeable. Here, this isn’t the case. The first big difference we see is in stride length. The Pro has a 17″ stride length and the classic only has a 15″ stride length. For taller users, the 2″ difference is going to be appreciated. Remember, 20″ is the gold standard for ellipticals. Another big difference is seen with the amount of resistance levels: the Pro offers 20 while the classic only offers 16. This isn’t as important as stride length, but more resistance control is better than less in my book. When it comes to workout programs, the Pro, again, offers 20 while the classic only offers 16. This isn’t a deal breaker, but more is better in the workout department (usually). I didn’t spend any time on the flywheel earlier because I wanted to discuss it here. The flywheel is what the pedals are attached to and basically provides your resistance. The usual consensus is that when it comes to bikes and ellipticals, heavier flywheels are better because they provide smoother resistance and smoother rides. The Pro has a 15 lb flywheel and the classic only has a 13 lb flywheel. Honestly, I’m not sure you’d be able to tell much difference here, but most experts agree a heavier flywheel is preferred. Last, but not least, is the warranty department. We see a huge difference between the warranties offered here as mentioned above. Personally, the difference in warranty between the two models is enough to warrant the price difference for me. When you consider the longer stride length, the heavier flywheel, and the extra resistance levels/workout programs, it’s really a no brainer. The ProForm Hybrid Trainer Pro is significantly superior to the original Hybrid Trainer and I think the extra $200 is warranted. The ProForm Hybrid Trainer Pro combines two machines, an elliptical and a recumbent bike, to give you one product that can provide benefits from both. Ellipticals and recumbent bikes are both low-impact forms of exercise, so it makes great sense to try and combine them. To answer my first question- yes, I think the Hybrid Trainer Pro is capable of offering a pretty serious workout. With 20 levels of resistance and 20 different workout programs, I think it has plenty to offer. Just keep in mind, as a hybrid machine, it’s not going to feel perfect as either. As an elliptical, the stride length is on the short side, so you won’t be able to stretch out fully (unless you too are on the short side). I would compare this to the feeling of sprinting vs jogging- you can jog on this trainer, but you won’t be able to sprint very comfortably. As a bike, the pedal motion might feel a little awkward since it’s more elliptical than your standard circular pedal motion. In this way, it’s kinda like a recumbent trainer. To answer my second question- the Pro definitely offers enough to warrant the extra cost over the Hybrid Trainer. There are significant differences between the two machines, not to mention a huge difference in warranty. If your budget has a little flexibility, I would recommend going with the Pro. Overall, I think the ProForm Hybrid Trainer Pro is a pretty good buy if your expectations are realistic. If you’re looking for a gentle workout machine that won’t kill your budget, you’ll probably be satisfied.